Hoverspeed was a ferry company that operated on the English Channel from 1981 until 2005. The company was formed in 1981 by the merger of the rival hovercraft operations of Seaspeed and Hoverlloyd. On the 16th February 1984 Hoverspeed was sold to its directors for a nominal sum following losses of £3.2 million. In June 1986 Hoverspeed was sold to Sea Containers (the owners of Sealink British Ferries) for £5 million. In 1990 following a hostile takeover bid Sea Containers sold Sealink British Ferries to Stena Line, Hoverspeed and a number of other assets were excluded from the deal. 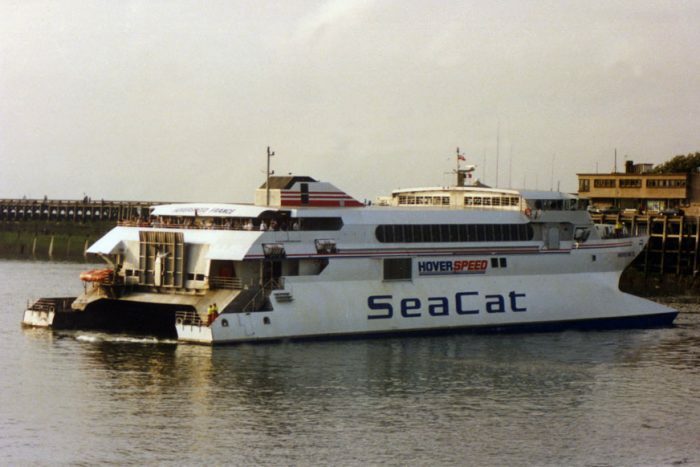 In June 1991 Hoverspeed introduced the first Seacat services from Dover to Calais and Boulogne. October 1st 2000 saw the final hovercraft services from Dover, all services in future would be operated by Seacats and Superseacats. After years of losses due to strong competition and the loss of Duty Free, Hoverspeed announced that they would cease operations on the Dover-Calais route, ending over 40 years of service. The last ferry service was on November 7, 2005.